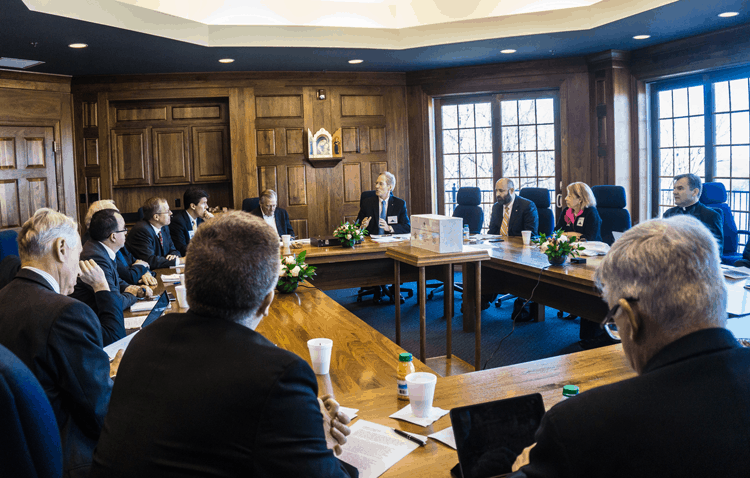 Christendom College will welcome sixteen presidents of Catholic colleges and universities across America to its Front Royal, Virginia, campus for the latest Ex Corde Ecclesiae Presidents Roundtable. To be held February 8-9, the Roundtable will examine the challenges and opportunities facing Catholic institutions of higher education, giving the presidents the opportunity to reflect and assist one another in strengthening the Catholic identity of their respective institutions. Initiated by Christendom president Dr. Timothy O’Donnell, the Ex Corde Ecclesiae Presidents Roundtable is a private association of presidents of Catholic universities, colleges, and institutes, who have embraced the vision of Catholic higher education as presented in the Apostolic Constitution Ex Corde Ecclesiae of Pope Saint John Paul II and developed by Pope Benedict XVI. During their private meetings, the presidents will converse and show mutual support for each other concerning challenges and problems relating to the leadership of their institutions. These discussions will focus on topics ranging from student life, the role of faculty at institutions, to the Church’s mission to evangelize. All discussions will be in service to the individual mission and unique charism of each institution. As a special guest, Fr. Wojciech Giertych, O.P, Theologian of the Papal Household, will personally open the Roundtable’s spiritual reflections. This will lend an atmosphere of prayer and spiritual reflection to the meetings, giving the presidents the opportunity for spiritual renewal as well. The Ex Corde Ecclesiae Presidents Roundtable normally meets every two years, promoting fellowship and cooperation among presidents to strengthen the Catholic identity of their schools as articulated by the Magisterium of the Catholic Church.